Today, one hundred years ago, the Battle of the Somme had been raging for one hundred days. The massive bombardment of the German lines had started one hundred days before and terrible slaughter had ensued. There would still be forty-seven days of fighting to come. It is 100 days since our massive bombardment of the Germans began and 92 days since we went over the top believing this battle on the Somme was ours. 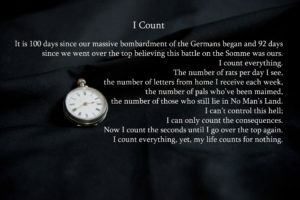 I count everything. The number of rats per day I see, the number of letters from home I receive each week, the number of pals who’ve been maimed, the number of those who still lie in No Man’s Land. I can’t control this hell; I can only count the consequences. Now I count the seconds until I go over the top again. I count everything, yet, my life counts for nothing.